Ovega-3® is The Better Choice. Go ahead, make some waves. You want the heart, eye, and brain health benefits that are associated with DHA and EPA omega-3 fatty acids*—no fishy business. That’s why Ovega-3® is the better choice. Ovega-3® is a vegetarian/vegan, sustainable omega-3 supplement with DHA and EPA extracted from algae, a trusted natural source. So, it has the same benefits as other DHA and EPA sources like fish, without the fishy aftertaste. Do you know fish get their omega-3s from the algae they eat? Ovega-3® is the vegetarian/vegan alternative to fish oil. 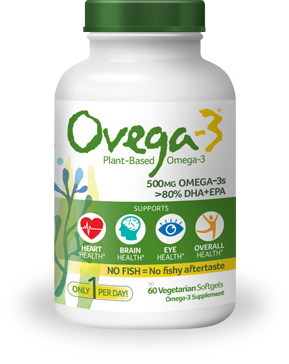 Fish get their omega-3s from algae 1, and so does Ovega-3®. Why not go straight to the same trusted plant source for the heart, brain, eye, and overall health benefits that omega-3s provide? * Oh, and an added bonus: No fish means no fishy aftertaste. Not all omega-3 fatty acids are the same. EPA and DHA, both important to heart health*, are found mainly in fish3. The EPA and DHA in fish come from the algae they eat1. ALA is the omega-3 typically found in plant sources like flax oil and chia seed oil2. But your body converts ALA to EPA and DHA only in small amounts3. Ovega-3® is a 100% fish-free source of Omega-3 of which more than 80% are EPA and DHA.